We know that PHP is a widely used open source general-purpose scripting language for creating dynamic websites and interactive web applications. 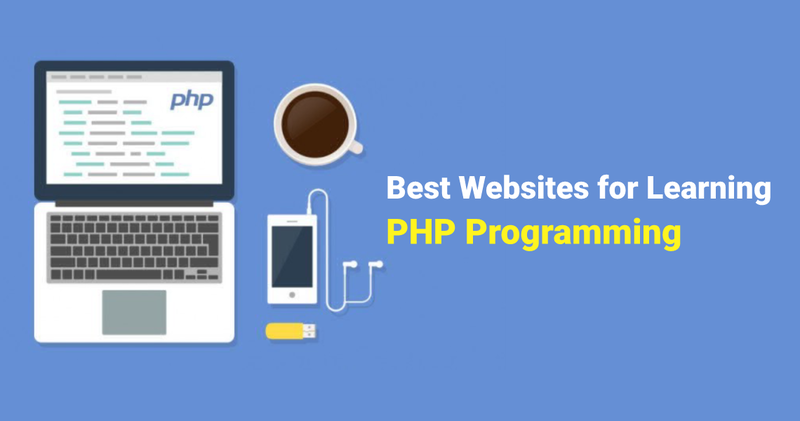 The primary attractions we prefer it are its widgets which are made utilizing PHP, and that is the reason for learning PHP programming is much important. Facebook, Yahoo, Flickr and several popular websites are also using PHP. The one thing that individuals don’t recognize is about coding PHP, or some other programming language is that it is really easy to train yourself. One doesn’t particularly need to spend a large amount of money or visit any tech school for certifications. We have gathered here a list of 15 best websites to learn PHP programming. Even if you already know the fundamentals of PHP, these sites will help you to upgrade your skillset. Whether you are a beginner, intermediate or pro, these under given online sites will surely help you to develop your skills more. These are the best PHP tutorials for beginners to advanced level programmers. Codecourse is one of the best websites to learn PHP. Earlier and more famously known as PHP academy, It has beyond PHP and has added other web development and tools in their kitty, which may be the reason that incited the change in name. However, regardless of the name, the PHP video tutorial by Codecourse are very descriptive and contains insights about every aspect of the language. If you just start learning PHP, this site will perfect match for you. The tutorial videos are available on their official website and their YouTube channel. The official PHP manual is the complete guide to PHP programming. It is one of the best PHP tutorials for beginners. It nearly includes everything from basics to the implementation of security and other PHP functions. PHP manual is the best PHP tutorial for beginners and easy to understand. If you need to know anything about PHP, you can find in this guide. KillerPHP is the best site to learn PHP. It is mainly for the videos and it’s a hands-on tutorial. Every section of the tutorial has a complimentary video in the end though not that which you will call of a high-caliber. KillerPHP is one of those unusual wild cards that turns out to be the most helpful one. According to the name, PHP 101 is created while keeping the absolute beginner in mind. If you are a beginner and learning PHP from scratch, then this guide is suitable for you. The site comprises engaging and useful tutorials with clear, compact and completely easy to understand for the beginners. It is one of the best websites to learn PHP. When you are finished with the entire tutorial, you will get the ability to create a simple RSS news aggregator. TutorialsPoint is the best site to learn PHP. It has an entire section dedicated just to PHP programming with guides and lessons. It is ideal for beginners and intermediate level programmers. Their method of teaching and the short tabs for various concepts makes you believe that it is only another version of W3Schools. It provides best PHP tutorials for beginners. It also gives an ebook for free download as a PDF document. For PHP reference, PHP Tutorial by Tizag is the best site to learn PHP. It is a mainly concentrates on the definition of PHP, commands, and methods for utilizing. You better keep it bookmarked because you will be required this tutorial, particularly while doing the practical coding since it works as a direct reference just like a textbook. The SitePoint is a modern way as its guides and tutorials are presented in the article-like format. It is one of the best PHP tutorials for beginners and great for intermediate and pros. It will help them to stay up-to-date with latest PHP trends. If you are one of the individuals who prefer reading and learning instead of watching video tutorials, you may like SitePoint for learning PHP. W3School is the best website to learn PHP online. It is more related to PHP Tutorial by Tizag. The entire style and presentation are almost same. But that doesn’t mean the guide is worthless. In fact, it can be utilized as a reference. This online guide is free to learn and also gives certification that costs nearly $95. Price: Free, But if you need certification, that costs $95. Udemy also the best website to learn PHP online. It offers PHP courses by specialists on their subject expertise and students can obtain those courses and benefit from them. But it isn’t a free course, and if you are not ready to pay for learning PHP, this site is not preferable you. Lynda.com isn’t actually a tutorial site or a website that holds blogs on PHP. But Lynda is a website that gives a platform for mentors and experts to distribute their courses in their specific subject of expertise and then students can get the knowledge and experience from the experts. Hacking With PHP is one of the best PHP tutorials for beginners. It comprises of several chapters breaking down into separate topics and components. It is giving an overview of the language with a brief introduction and some practical exercises with added links to resources. Hacking with PHP is the best website to learn PHP online and its content is to the point and particular. Develop PHP is the best website to learn PHP online. It includes a different kind of online PHP tutorials for beginners, intermediate and advanced level programmers. The tutorial videos are basically promoted through YouTube and Develop PHP site. But it provides an easier and ordered way to learn any course. PHPJabbers is a masterpiece for an intermediate to advanced programmers. It includes a lot of specific guides for intermediate to advanced level PHP programmers. It is the best website for learning PHP programming. It will assist in learning and create a PHP calendar to set up a custom Captcha system. Learn PHP Tutorial is one of the best PHP tutorials for beginners. It offers a list of downloadable videos that train you through the fundamentals of PHP. It’s preferable for beginners, and it gives a more visual guide. You’ll learn PHP, as well as realize what you can do with it through examples and best practices. PHPBuddy is one of the best PHP tutorials for beginners. It includes online tutorials, lessons, and references on PHP programming. It has full of texts and with limited videos and screenshots. But don’t get fear with it; still, it is the best website to learn PHP online. Well, We hope you will able to find at least one resource to get you start learning PHP programming. These sites will assist you to get a better knowledge and improve your essential PHP skills. In case you think we missed any other great resources, let us know in the comments.